While the Cognitive-Health category grows in demand, VIRUN have invested in developing water soluble and stable forms of these unique ingredients so they can be used in beverages, foods, supplements and “shots.” Lipids and fatty acids such as Phosphatidylserine and DHA Omega-3 have scientifically supportive health claims yet are nearly impossible to add to beverages and shots as clearer and stable without use of chemical additives (such as EDTA, Polysorbates, or ingredients not approved for direct food use, such as Hydrogenated Castor Oil PEG-40 or Castor Oil, polyoxyethylated). 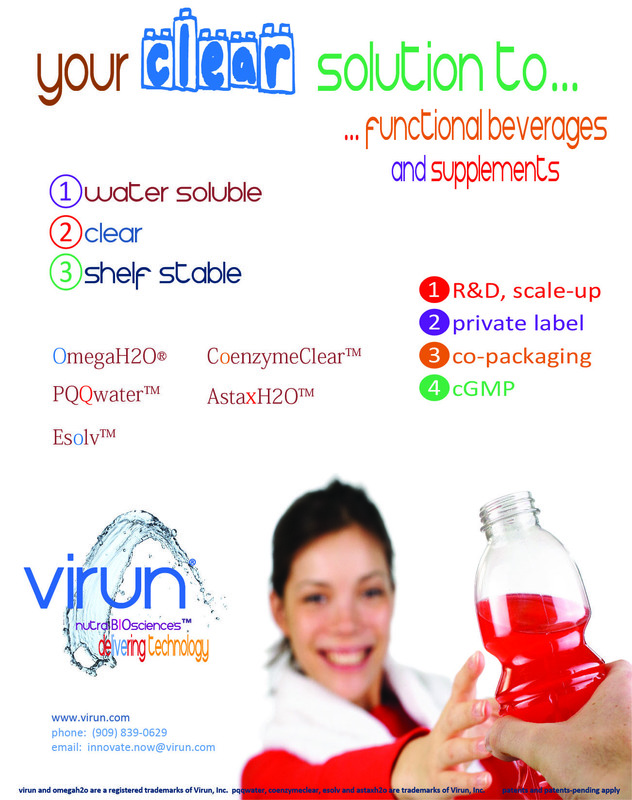 VIRUN develops clean-label-claim cognitive ingredients that dissolve into water clearer, or clear with colored tint and are stable. These ingredients allow for aggressive cognitive health claims with natural lipids, such as Phosphatidylserine, and fatty acids, such as DHA omega-3 (OmegaH2O®) that are necessary for brain function and are naturally occurring in the human brain. Other unique ingredients include carotenoids, such as Lutein, quinones such as Pyrroloquinoline quinone (PQQwater™), Astaxanthin (AstaXH2O™) and Resveratrol. VIRUN specializes in creating water soluble liquid and powder concentrates that easily solubilize in your application without impacting flavor and are stable. The cognitive health category is a growing category and is influenced by unique and progressive scientifically proven ingredients. For example, recently published in Dementia and Geriatric Cognitive Disorders (Vol. 38, No. 1-2, 2014, titled: Phosphatidylserine Containing Omega-3 Fatty Acids May Improve Memory Abilities in Nondemented Elderly Individuals with Memory Complaints: Results from an Open-Label Extension Study) showed that 100 mg/day of Phosphatidylserine-DHA might be associated with improving or maintaining cognitive status in elderly subjects with memory complaints. This new science has introduced ingredients that are not yet prevalent in food, beverage, supplement and shot categories. One such reason is the difficulty in stabilizing these unique ingredients because they are not very water soluble. VIRUN’s over 40 patented and patent-pending technologies allow these ingredients to be formulated in almost any application with exceptional results, flavor and in some instances, improved bioavailability. The cognitive health category is dubbed the “last frontier” due to the growing interest, growing health concerns toward cognition and due to the lack of saturation in the market place. VIRUN’s unique technologies allow these ingredients to quickly go-to-market and VIRUN offers finished product capabilities in addition to the raw concentrates. 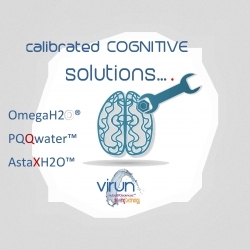 Add smart ingredients to your smart beverage, shot or supplement product, contact VIRUN’s innovation team today for cognitive health ingredients….